Russian federal revenue from oil and natural gas production has declined significantly in response to low oil prices. However, Russian oil and natural gas companies’ capital investment programs have been less affected, if at all. Russia’s two main hydrocarbon taxes are calculated by formulas that result in lower tax rates at lower crude oil prices. As oil prices fall, petroleum companies retain a larger share of revenue, but government revenues from oil and natural gas production fall even faster than prices. In 2015, the Brent crude oil price, measured in U.S. dollars per barrel, declined by 47% versus 2014, and the price for the first half of 2016 is down an additional 31% versus the first half of 2015. Because of changes in the exchange rate, the decline in the Brent price as measured in Russian rubles is not as dramatic: a 16% decline from 2014 to 2015, and an additional 16% from the first half of 2015 to the first half of 2016. 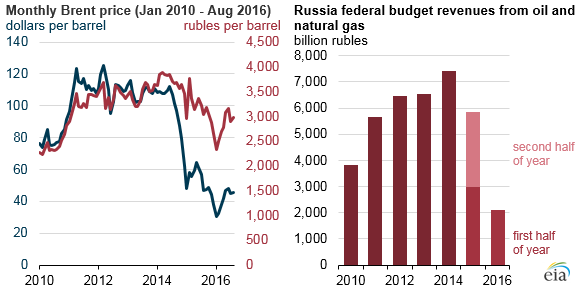 Over the same periods, Russian federal budget revenues from oil and natural gas fell by 21% and 29%, respectively. Many Russian petroleum companies have, in ruble terms, increased investment or seen only modest declines in investment over the same period. State-owned Rosneft and independent Lukoil are Russia’s two largest oil producers. Together, the two companies account for about half of Russia’s roughly 11 million barrels per day oil production. While oil prices and government revenues declined in 2015, Rosneft increased its capital expenditure on exploration and production for projects in Russia by 30% compared with 2014. Rosneft’s exploration and production capital expenditure in the first half of 2016 was 33% higher than in the first half of 2015. In comparison, Lukoil’s spending on exploration and production for projects in Russia declined 11% in 2015 versus 2014, and expenditures in the first half of 2016 were 2% lower than in the first half of 2015. The favorable tax structure and exchange rate for Russian oil companies, the subsequent continued high investment levels at Rosneft, Lukoil, and other Russian oil and natural gas companies, and slower production declines at old fields all have helped push production to record post-Soviet levels. Considerable investment has also been made in many new fields that have recently started up or are due to start in the near future. The Russian government has implemented or proposed various measures to increase revenues that could affect companies’ future investment plans. The Russian government has changed the two main hydrocarbon taxes (minerals extraction tax and export tax) several times in recent years. The most recent changes and proposals for upcoming changes all tend to raise the taxes paid by oil and gas companies. In January 2015, the Russian government announced its intention to sell some of its shares in several Russian companies, including Bashneft and Rosneft. Bashneft was one of Russia's 10 largest oil producers. On October 12, 2016, the federal government sold its 50.08% controlling stake in Bashneft to Rosneft, Russia's largest oil producer, for $5.3 billion. The Russian government currently owns 69.5% of Rosneft. It also intends to sell up to 19.5% of Rosneft, retaining a controlling interest. In addition to taxes, the Russian government also collects dividends from oil and gas companies in which the state is a shareholder. In April 2016, the Russian government directed state-controlled companies to pay 50% of 2015 net income out as dividends, nearly double the dividends companies would normally pay. Oil companies have objected to the tax and dividend increases, arguing they divert money from capital investment programs. For more information on Russia's energy industry, see EIA's Country Analysis Brief on Russia.